Medical malpractice occurs when a negligent act or omission by a doctor or other medical professional results in damage or harm to a patient. Negligence by a medical professional could include an error in a diagnosis, treatment, or illness management. If such negligence results in injury to a patient claims may exist against the doctor if his or her actions deviated from generally accepted standards of practice; against the hospital for improper care, such as problems with medications, sanitation or nursing care; or against local, state or federal agencies that operate hospital facilities. Medical malpractice laws are designed to protect patients' rights to pursue compensation if they are injured as the result of negligence. However, malpractice suits are often complex and costly to win. While theoretically, you can seek compensation for any injury caused by negligence, regardless of its seriousness, time and money make it unrealistic to sue for an injury that is minor or resolves quickly. Therefore, if you believe you have a medical malpractice claim, it is important to consult with an attorney who can help you determine whether your claim is worth pursuing. One of the most important aspects of a medical malpractice action is establishing the standard of care to be applied to the health care professional. Medical professionals are often heard to refer to medicine as an art, rather than a science, and although errors in judgment may result in injury to a patient, not all medical errors are actionable as negligence. To find a medical professional legally at fault, it must be shown that his or her conduct fell below a generally accepted standard of medical care. The plaintiff must present expert testimony to establish the standard of care applicable and that the defendant failed to meet that standard. In some cases where a defendant's violation of a standard of medical care is so apparent as to be comprehensible to the average person, expert testimony may not be required. Causation, another element of medical malpractice actions, is sometimes challenging to establish. Specifically, the plaintiff must show that his or her health care provider's deviation from the applicable standard of care resulted in his or her injury. This is challenging because sometimes the health care provider's deviation from the standard of care may not have caused the plaintiff's eventual injury. 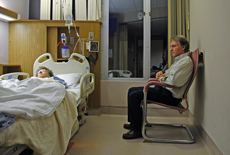 If an injured patient does not know exactly what caused his or her injury, but it is the type of injury that would not have occurred without medical negligence, he or she might be able to invoke a legal doctrine known as "res ipsa loquitor," permitting the jury to infer the defendant's negligent conduct. A medical professional may be held liable for the negligent prescription of a medication or medical device if he or she prescribed an incorrect medication or dosage or ignored the manufacturer's instructions. In some cases, a pharmaceutical manufacturer may be liable where a drug caused a patient injuries, but only if the manufacturer failed to warn of potential side effects or dangers of the drug. In most cases, the prescribing physician is considered a "learned intermediary," which means that because of his or her superior medical knowledge, and the fact that he or she has been given adequate information from the manufacturer, he or she is in the best position to determine whether a particular drug or device is appropriate for a patient. Thus, the physician has the primary duty of advising the patient of the risks and side effects of a medication or medical device he or she prescribes. In many situations, the failure to obtain a patient's "informed consent" relative to a procedure or treatment is a form of medical negligence, and may even give rise to a cause of action for battery. Although the specific definition of informed consent may vary from state to state, it means essentially that a physician (or other medical provider) must tell a patient all of the potential benefits, risks, and alternatives involved in any surgical procedure, medical procedure, or other course of treatment, and must obtain the patient's written consent to proceed. Although doctors very rarely promise specific results from procedures or treatments, in some cases they do, and the failure to produce the promised results may give rise to an action for breach of contract or breach of warranty. For example, a plastic surgeon may promise a patient a certain result, which result may be judged more easily than other types of medical results, simply by viewing the patient. Similarly, if a patient is not satisfied with the outcome of a procedure, and the physician had guaranteed or warranted a certain result, the patient may attempt to recover under a theory of breach of warranty. Due to the power and resources of the health care industry, many states have passed legislation making it more difficult to bring and prevail in medical malpractice actions. In most states today, physicians and hospitals are protected by legal limits, called "caps," on the amount of damages and attorneys' fees that can be awarded in malpractice suits. Also, barring extraordinary circumstances that affect the case, state laws provide set time-frames within which a plaintiff must file a malpractice action in court. One obstacle plaintiffs in many states may have to overcome before they can file a malpractice action against a health care professional is the requirement that they file what is commonly known as a "certificate of merit." In order to file a certificate of merit, a plaintiff will first have to have an expert, usually another physician, review the relevant medical records and certify that the plaintiff's health care provider deviated from accepted medical practices and that the deviation resulted in injury to the plaintiff. The plaintiff's attorney then files the certificate of merit, which confirms that the attorney has consulted with a medical expert and that the plaintiff's action has merit. Medical malpractice can be committed by several types of health care professionals and where a hospital employee commits malpractice, the hospital itself may be held liable under the legal doctrine of "respondeat superior." Under this theory, an employer may be held liable for the negligent acts of its employee if the employee was acting within the scope of his or her employment when the negligent act or omission occurred. This doctrine is very important to plaintiffs in medical malpractice cases, because it helps ensure there will be a financially responsible party to compensate an injured plaintiff. In some situations, commonly involving attending physicians working in hospitals, health care providers are considered independent contractors rather than employees, which makes the doctrine of "respondeat superior" inapplicable. Thus, if a doctor or other health care professional is an independent contractor and commits malpractice while treating a patient in a hospital the hospital cannot be held liable for the doctor's negligence. However, the hospital can be held liable for its own negligence, for example, in granting attending privileges to an unlicensed or incompetent physician. In general, there are no guarantees of medical results. An unanticipated or unsuccessful result from medical treatment or surgery does not, in itself, mean that medical malpractice has been committed. Nonetheless, if you believe you may have been the victim of medical malpractice, you should meet with an experienced attorney as soon as possible to discuss the facts of your case and receive a professional evaluation of your situation.